Grail said it will launch a 50,000-participant clinical trial next year designed to assess its investigational blood test, which uses next-generation sequencing (NGS) technology to detect lung cancer and other cancer types. Participants will range in age from 50 to 77. Approximately half the participants in the SUMMIT trial will be people at high risk for lung and other cancers due to a significant smoking history. The other half, Grail said, will be participants who are not at high risk for cancer based on smoking history. Grail identified lung cancer as well as breast cancer as areas of interest when it was launched in January 2016 with $100 million committed by investors that included sequencing giant Illumina, Bill Gates and Jeff Bezos. “Our goal is to deliver a pan-cancer test in the 2019 timeframe,” Jay Flatley, then Grail’s chairman, who at the time was also CEO of Illumina and is now its Executive Chairman, at the time of the funding. SUMMIT will be conducted in the U.K. by Grail partners that include UCL (University College London) and University College London Hospitals (UCLH) National Health Service (NHS) Foundation Trust. For UCLH and UCL, SUMMIT supports their goal of assessing the feasibility of implementing lung cancer screening in the U.K. People determined to be at high risk for lung cancer will have an opportunity to undergo lung cancer screening with low dose computed tomography (LDCT) and will have access to resources for smoking cessation through the NHS in the U.K.
Another SUMMIT study partner, Lung Cancer Alliance (LCA), a non-profit organization based in Washington, DC, has provided guidance on the study design, Grail said. “The SUMMIT study will support the development of our blood test for the early detection of multiple cancer types in a diverse population,” said Anne-Renee Hartman, M.D., vice president of clinical development at Grail. According to UCLH, high-risk lung cancer participants—which the study will classify as “Group A”—will be identified by inviting residents of north and east London who may meet the eligibility criteria based on their smoking history for a lung health check. In addition to providing a blood sample, participants who are eligible and decide to join Group A will be screened for lung cancer using a low dose CT scan. The SUMMIT Study will also offer smoking cessation support to smokers who would like to stop, UCLH said. Participants in the low-risk lung cancer cohort or “Group B” will be invited via a letter from their general practitioner, and, if eligible and interested in participating, will attend a study site in order to consent to join the study, donate a blood sample and fill out a questionnaire. SUMMIT would be Grail’s latest component in what it calls one of the largest clinical research programs ever pursued in genomic medicine in collaboration with leading community and academic medical centers globally. In addition to SUMMIT, GRAIL is conducting the Circulating Cell-free Genome Atlas Study (CCGA; NCT02889978) set to enroll at least 15,000 people with and without cancer across 142 sites in the U.S. and Canada. The study aims to collect blood and tumor tissue from donors with a new diagnosis of cancer, and blood from donors not diagnosed with cancer, in order to characterize the population heterogeneity in cancer and non-cancer participants and develop models for distinguishing cancer from non-cancer. 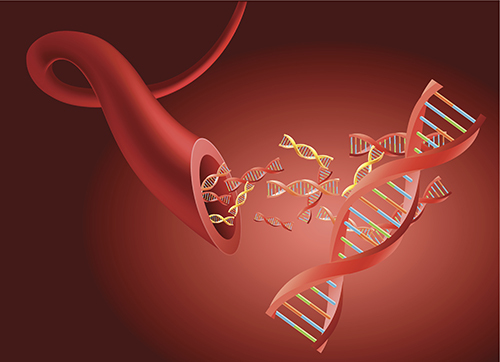 In June, Grail announced positive data from the first sub-study of CCGA, in which blood samples from 127 participants with lung cancer were evaluated with three prototype genome-sequencing assays. Grail said detection rates (sensitivity at 98% specificity) across the assays ranged from 38% to 51% in participants with early-stage lung cancer (stages I-IIIA), and from 87% to 89% in those with later stages (stages IIIB-IV). Grail is also conducting the STRIVE trial (NCT03085888), designed to train and validate an assay to detect invasive breast cancer in patients undergoing mammography. STRIVE has enrolled approximately 100,000 women at the time of their screening mammogram across 37 sites in the U.S., the company said. “We’ve made tremendous progress in just two-and-a-half years, and we’re on our way to fulfilling our mission of making early cancer detection through a blood test a reality,” Hartman stated in a commentary posted on the company’s website.